Cedar fencing is the most economically friendly fencing product available. It is 100% recyclable and requires less total energy to harvest. It is naturally sustainable and grows quickly. Natural cedar fencing also has a built in resistance to rot and insect damage. 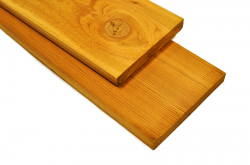 Why Buy from Sound Cedar? At Sound Cedar, we don't want to sell you an inferior product that won't last and you'll have to replace in a few years. Unfortunately, those products are out there so start with, we quality control our own products so we get to offer you the top quality fencing. That means less waste, and less returns for you because we stand by our products. You'll find a lot of 5/8" fence boards out there, typically at your big box stores that don't care about quality. What you'll end up with is increased twisting/warping and increased splitting at the ends. We recommend a full 3/4" product for a quality fence that will last for years, but we do offer a more economical priced 5/8" fence board as well.